Map showing State Forests in Michigan. The Pere Marquette State Forest encompasses lands in Michigan’s northern Lower Peninsula, on the western side of the state. Counties within the Pere Marquette are: Leelanau, Benzie, Grand Traverse, Kalkaska, Manistee, Wexford, Missaukee, Mason, Lake, Osceola, Oceana, Newaygo and Mecosta. There are several trail-ways in the Pere Marquette, the longest of which are the Muncie Lake Pathway, at 11.5 miles (18.5 km) in length; the VASA Pathway, at 16.7 miles (26.9 km); and the Cadillac Pathway, at 11.3 miles (18.2 km). 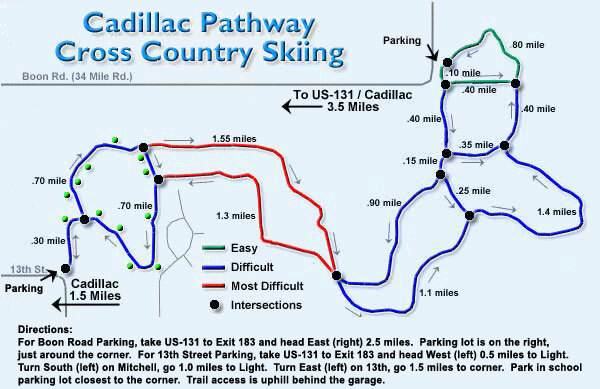 The trails are well suited to biking, hiking and cross country skiing. The North Country Trail includes 65 miles (105 km) within the Pere Marquette, and over 1,500 miles (2,400 km) in Michigan as a whole. It is named after French explorer Jacques Marquette, who founded the first European settlement of Michigan in 1668. This Michigan state location article is a stub. You can help Wikipedia by expanding it. This page was last edited on 9 June 2018, at 05:55 (UTC).